By new I actually mean “I got this cover for my kindle several month ago but never got around to taking the pictures until today”. The good news is that it still looks absolutely fabulous despite the extreme amount of use it has gotten. 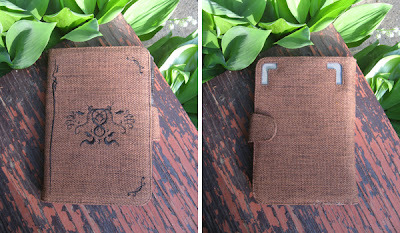 It’s one of the ‘Eco-nique’ Hemp cases by Tuff-Luv. This one of course is for the Kindle Keyboard but they have a selection of gorgeous cases for all the kindles as well as for tablets, phones, passports and more. Their selection of lovely products can be found on Amazon.ca or Amazon.com. The hemp material is lovely to hold, you don’t have to worry about fingerprints or sweaty palms from leather. It’s eco-friendly (always a plus in my books) and also happens to be vegan and cruelty-free so there was no harm done in the making of this cover. It has a spot to hold a pen, small notebook or papers and cards. It snaps closed nice and easy and it was the simplest thing in the world to get going. At the top of the kindle you’ll see a small Velcro tab; all I needed to do was open that tab and slide my kindle in from the top. 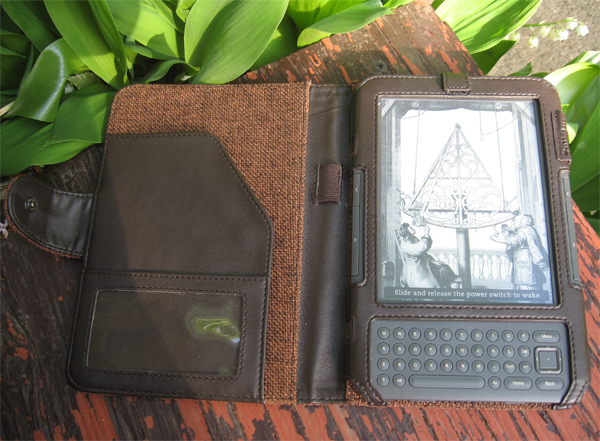 With the tab back in place this ereader is snug as a bug in a rug. It doesn’t shift at all, all the buttons are easy to use still and you can charge it without ever having to take it out of the case. In fact, since I got this cover, I’ve never removed it. It definitely gets a recommendation from me! Once again all the Tuff-Luv cases can be found on Amazon.ca and Amazon.com (colors and styles all vary quite a bit). Mine came from Amazon.ca. If you enjoyed this post, why not Subscribe to the Ebook Apothecary!